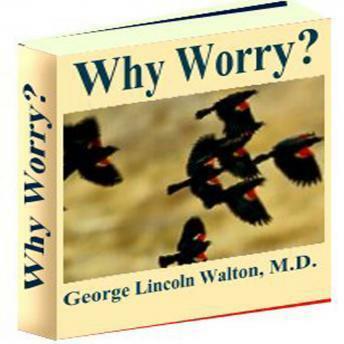 The habit of worry is not to be overcome by unaided resolution. It is hoped that the victim of this unfortunate tendency may find, among the homely illustrations and commonplace suggestions here offered, something to turn his mind into more healthy channels. It is not the aim of the writer to transform the busy man into a philosopher of the indolent and contemplative type, but rather to enable him to do his work more effectively by eliminating undue solicitude. This elimination is consistent even with the strenuous life. One writer has distinguished between normal and abnormal worry, and directed his efforts against the latter. Webster's definition of worry (A state of undue solicitude) obviates the necessity of deciding what degree and kind of worry is abnormal, and directs attention rather to deciding what degree of solicitude may be fairly adjudged undue. In the treatment of a subject of this character a certain amount of repetition is unavoidable. But it is hoped that the reiteration of fundamental principles and of practical hints will aid in the application of the latter. The aim is the gradual establishment of a _frame of mind_. The reader who looks for the annihilation of individual worries, or who hopes to influence another by the direct application of the suggestions, http://ia300016.us.archive.org/1/items/8whwr/8whwr10.txt (2 of 90)12/04/2006 2:19:43 AM http://ia300016.us.archive.org/1/items/8whwr/8whwr10.txt may prepare, in the first instance for disappointment, in the second, for trouble. The thanks of the writer are due to Miss Amy Morris Homans, Director of the Boston Normal School of Gymnastics, for requesting him to make to her students the address which forms the nucleus of these pages.